Local restauranteurs and bar owners are set to read some of their nastiest online reviews at an eatery near 14th Street tomorrow night. Compass Rose, located at 1346 T St. NW, is scheduled to host is second “Industry Reads Bad Reviews” event Wednesday, Dec. 21, from 10 p.m. to 1 a.m. The reading’s lineup includes many of the D.C. restaurant world’s movers and shakers: Smoked and Stacked’s Marjorie Meek-Bradley, The Passenger’s Tom Brown and Timber Pizza Company co-founder Andrew Dana, and others. In the spirit of the popular (and purposely self-deprecating) segment “Celebrities Read Mean Tweets” from Jimmy Kimmel Live!, Compass Rose is hosting its second evening to toast the food and beverage industry’s harshest Social Media critics by taking their criticisms (reviews, tweets, Facebook posts, emails) and airing them out for everyone to hear. 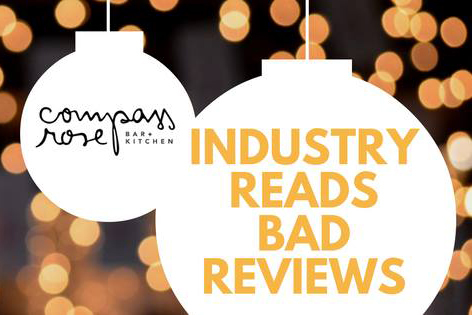 We invite you to join us at Compass on December 21 after our The Compass Rose Holiday Market at 10 p.m. for “Industry Reads Bad Reviews II” with some of our favorite bar and restaurant folks performing a dramatic reading of their best (worst?) “bad” review. Service industry professionals are constantly under the scrutiny of everyone: their consumers, food critics–even one another. While constructive criticism is always welcome, we’ve all encountered the occasional review that is not based in reality, but merely a projection of simplistic negativity. Rather than allowing these blurbs of craziness to get us down, let’s reclaim the power through community and humor. We’ll laugh at ourselves and recognize that you truly can never please everyone.